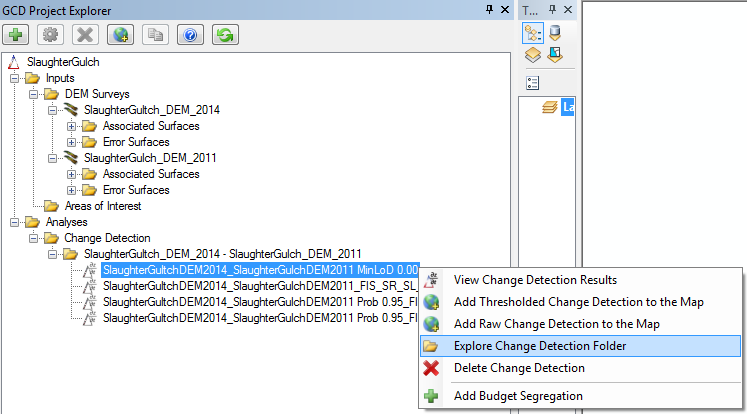 This will bring up a windows explorer where the results for the selected change detection can be explored. The spatial results of the change detection in raster format without applying any thresholding techniques. Simply DEMnew - DEMold. The spatial results of the change detection in raster format with the error with the thresholding techniques applied. numerical results of the change detection in comma separated values format without applying any thresholding techniques. This is the areal and volumetric changes placed into preset bins. summary of numerical results of the change detection in tabular/.xml format. contains results without applying any thresholding techniques and with applying thresholding techniques. numerical results of the change detection in comma separated values format with the thresholding techniques applied. Simply DEMnew - DEMold. Bar chart of the actual area of change for erosion and deposition. Red is erosion and is represented by negative values. Blue is deposition and is represented by positive values. Bar chart of the relative area of change for erosion and deposition, absolute values are used to allow for easier comparisons. Both erosion and deposition are represented by positive values. Bar chart of the actual average depth of change for erosion and deposition. Bar chart of the absolute average depth of change for erosion and deposition, absolute values are used to allow for easier comparisons. Bar chart of the actual volume of change for erosion and deposition. Bar chart of the relative volume of change for erosion and deposition, absolute values are used to allow for easier comparisons. Histogram of the area of change. Histogram of the volume of change.